ROME (Reuters) - Italy's far right Deputy Prime Minister Matteo Salvini branded France an "international disgrace" on Tuesday for having driven two migrants across its border and dumping them in Italy. Italy demanded explanations from France and on Monday French media quoted the head of the Hautes-Alpes region that flanks Italy as acknowledging that its police had crossed the border, calling the incursion "an error". "What happened in Claviere represents an unprecedented offence against our country," Salvini wrote on Facebook. "We are facing an international disgrace, and (French President Emmanuel) Macron can not pretend nothing has happened." Macron has denounced Salvini's anti-immigrant policies, telling reporters in August that he represented the "main opponent" in Europe to nationalists like Salvini. In June, a spokesman for Macron's party said Salvini's moves to block charity rescue ships from docking in Italy "makes me vomit". 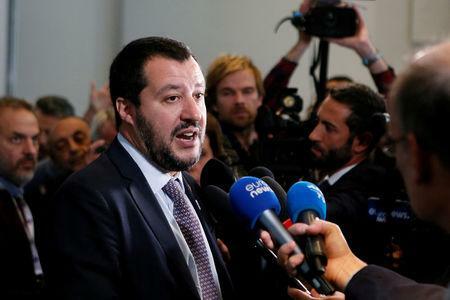 Salvini wrote on Facebook: "I wonder if international organizations, starting with the United Nations and European Union, do not find it vomit-making to leave people in an isolated area, without any assistance." He added, "Paris must inform us IMMEDIATELY the identities of the immigrants left in the woods. Names, surnames, nationalities, dates of birth." Alongside his comment was a photo of Macron with a bright, red face and the text: "International shame. Italy won't accept apologies."